LMU Munich’s historic Main Building is located in the heart of the city. 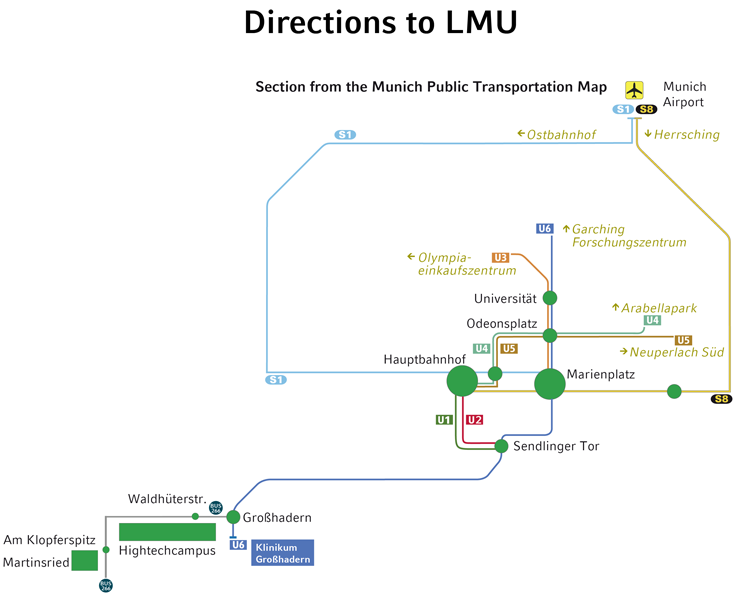 Since parking facilities near the Downtown Campus are extremely limited, we recommend that you use Munich’s excellent public transportation network. From the Munich Central Train Station take the U-Bahn (subway) line U4 (direction Arabellapark) or U5 (direction Neuperlach Süd) to Odeonsplatz. Change trains and take the U-Bahn line U3 (direction Olympia-Einkaufszentrum) or U6 (direction Garching-Forschungszentrum) as far as the Universität stop. Walk along the platform in the train’s direction of travel and use the stairway at this end of the station, which will bring you out directly in front of the LMU Main Building. From the Munich Airport take the S-Bahn (urban rail) line S8 (direction Herrsching) or S1 (direction Ostbahnhof) to Marienplatz. Change trains and take the U-Bahn (subway) line U3 (direction Olympia-Einkaufszentrum) or U6 (direction Garching-Forschungszentrum) as far as the Universität stop. Walk along the platform in the train’s direction of travel and use the stairway at this end of the station, which will bring you out directly in front of the LMU Main Building. The majority of the natural and life sciences are concentrated at the HighTechCampus in Großhadern / Martinsried in the southeast of Munich. With Autobahn A9 (from the direction of Nürnberg): Merge onto the Mittlerer Ring (direction Autobahn A96/Lindau), then take the A96 to the exit Blumenau. Follow signs to Gräfelfing, where Würmtalstrasse will lead you to our campus. With Autobahn A8 (from the direction of Stuttgart): At the expressway interchange München West merge onto Autobahn A99 (direction A96) and proceed to the three-leg interchange München Südwest. Merge onto the A96 (direction Munich) and continue as far as the Großhadern exit. Once in Großhadern, turn towards Gräfelfing, where Würmtalstrasse will take you past the campus. With Autobahn A8 (from the direction of Salzburg) or A95 (from the direction of Garmisch): Merge onto the Mittlerer Ring in the direction of Großhadern and Stuttgart. In Großhadern, turn towards Gräfelfing, where Würmtalstrasse will take you past the campus. From the Central Train Station take the U-Bahn (subway) line U1 or U2 to Sendlinger Tor. Change to U6 in the direction of Klinikum Großhadern and get off at Großhadern. Take the stairway to your left. At the top of the stairs keep left, where you will find yourself on Würmtalstraße. Either walk along Würmtalstraße for about 10 to 15 minutes until the campus (large modern buildings) comes into view on the left or take bus 266 or 268 in the direction of Planegg to Waldhüterstraße. From the Munich Airport take the S-Bahn (urban rail) S8 or S1 to Marienplatz. Change to the U-Bahn (subway) line U6 in the direction of Klinikum Großhadern and get off at Großhadern. Take the stairway to your left. At the top of the stairs keep left, where you will find yourself on Würmtalstraße. Either walk along Würmtalstraße for about 10 to 15 minutes until the campus (large modern buildings) comes into view on the left or take bus 266 or 268 in the direction of Planegg to Waldhüterstraße. The Medical Center of the University of Munich has facilities in two locations: downtown and in Großhadern in the southeast of Munich. All of the clinics and institutes of the Großhadern Campus are consolidated in one building. There is ample parking on campus. If you prefer to use public transportation, take the U-Bahn (subway) line U6 to the last stop (Klinikum Großhadern) or one of the following bus lines: 56 (bus stop Klinikum Ost); 266 or 269 (bus stop Klinikum Großhadern). The buses stop directly at the main entrance to the building.